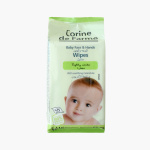 Corine de Farme Baby Face and Hand Wipes - Set of 25 | Multicolour | Paraben free. Alcohol free. Phenoxyethanol free. Keep your child's face and hands clean by using these wipes. They are paraben and phenoxyethanol free and is safe to use for your child. Wiping with these wipes nourishes your child's dry skin leaving it hydrated. Feature 2 : Cleanses and refreshes baby's face and hands. Feature 1 : Paraben free. Alcohol free. Phenoxyethanol free. Feature 3 : Suitable for sensitive skin.